The anatomy of a whale is absolutely fascinating, and one that you will want to learn all you can about. All whales are mammals and so that automatically tells us that they need to breath in air to fill their lungs. The overall structure of a whale is very similar to that of fish. Yet we will all agree that it is on a much larger scale. The anatomy of a whale is designed to allow it to easily move through the water. It is often amazing to see such a large creature move about with such grace. The front limbs of a whale are called flippers. They look like paddles and they will vary in size depending on the species of whale you happen to be looking at. These flippers move back and forth as a whale glides through the water. 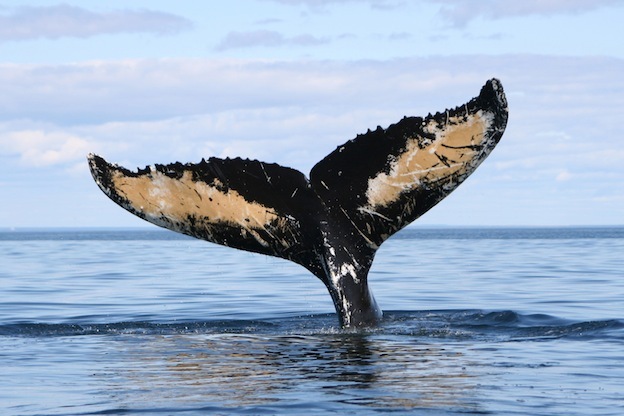 The majority of whales don’t have hind limbs but some of them do so it is worth mentioning here. They can appear to be short stubs or they can be feet that even have what look like toes on them. The back end of a whale is where you will see the dorsal fin. This is in place to help a whale remain balanced. You will notice that the size and even the shape of the dorsal fin vary by species. A few of them even have two dorsal fins but most have only one. Since it can be very cold in the waters where a whale lives, they need plenty of insulation. They get it in the way of what is called blubber. This is underneath the top layer of skin. That layer is very thin and doesn’t have very much hair on it at all. That is why the blubber is so important to help them stay warm. The size of the heart of a whale will depend on what species it is. All of them feature a heart with four chambers though. They also have vertebrae that are fused to the neck. It is this design of the whale anatomy that allows them plenty of flexibility in their movements throughout the water. As we mentioned, whales have to fill their lungs with air. In order to do so, they rely on a blowhole at the top of their body. Some whales will have one and others have two but they work the same way. It is this part of the whale anatomy that makes it possible for them to stay below the surface of the water for extended periods of time. The Sperm Whales are able to do so for up to one and half hour after taking air in. That is the longest time period known for any type of whale to remain under the water. Another part of the whale anatomy to take a close look at is the ears. They are designed to make living underneath the surface of the water simple for them. Both the outer and the inner ears work the same way which is why they can hear through vibrations. They designs of the ears allow them to receive the sounds in their lower jaw region rather than actually through their ear lobes. There are plenty of terrific books and sites online where you can view pictures of the whale anatomy. Looking at them as you read about it is a great way to help you identify the various areas on the body. You will also find it is easier for you to remember the anatomy of a whale this way. These huge mammals have a very detailed body anatomy that certainly works in their favor.